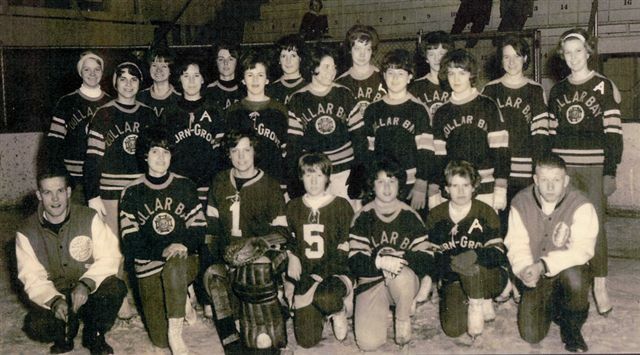 Back row left: Nancy Nikkinen, Carol Haanela, Diana Dover, Janice Jacobson, Ann Marie Tarbox, Kay Jacobson, Carol Boxer. Middle row: Christine Federighi, Linda Houle, Kathy Houle, Mary Young, Jeanne O'Neil, Susie Ylitalo. Front row: Merv Klemmet -Coach, Kathy Martin, Mary Ellen Lucchesi, Marie Verbanac, Roberta Klatzky, Micky Gagnon, Mike Verbanac -Coach. Please contact webmaster if you have info or pictures of any other Women's Teams.